The Association of Banks (ABL) has convened and elected today a new Board of Directors, headed by Joseph Torbey, who ran unopposed. “The ABL is a main pillar of the economic bodies and represents an active sector which plays an effective role in supporting the economy,” said Torbey. “We will continue to cooperate with the monetary authorities, especially in this crucial time in the region and fast development in the financial and banking sector in neighboring countries,” he said. 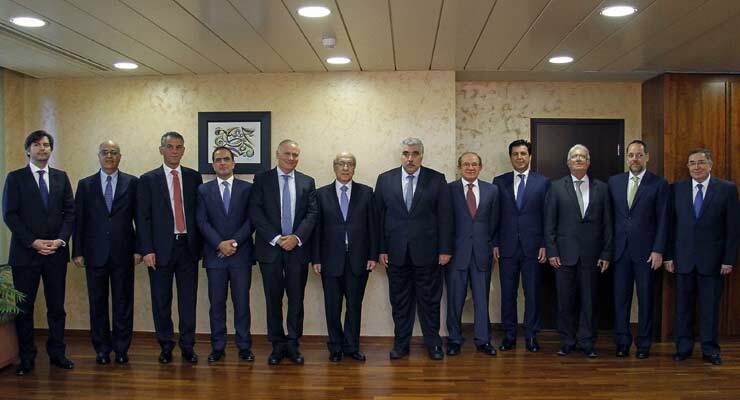 The new board consists of 12 members, including its chairman, Joseph Torbey (Chairman of Crédit Libanais), Nadim Kassar (Chairman of Fransa Invest Bank), Saad Azhari (Chairman of Blom Bank), Abdul Razzak Achour (Chairman of Fenicia Bank), Semaan Bassil (Vice-Chairman of Byblos Bank), Antoun Sehnaoui (Chairman of SGBL), Mohammed Hariri (Chairman of BankMed), Salim Sfeir (Chairman of Bank of Beirut), Marwan Kheireddine (Chairman of Al-Mawarid Bank), Tanal Sabbah (Chairman of Lebanese Swiss Bank), Freddie Baz (Group Chief Financial Officer at Bank Audi), and Walid Raphaël (Chairman of Banque Libano-Française). Two new members have joined the elected board: Semaan Bassil and Freddie Baz, replacing François Bassil, former ABL Chairman and Raymond Audi, former ABL Secretary. Azhari will be the ABL’s Vice-Chairman, Baz, itsSecretary, and Sabbah, the Treasurer.